Ah, holidays at the cabin. 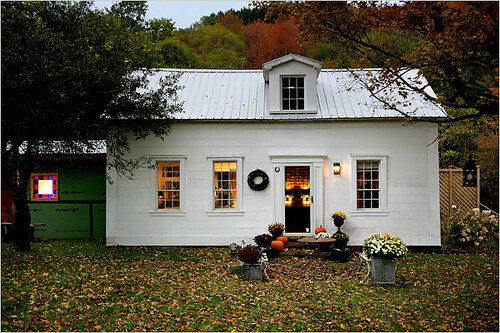 Ok, so this is not our cabin -- this little farmhouse in the Catskills belongs to painter Sean Scherer and his partner Mark Mayer. 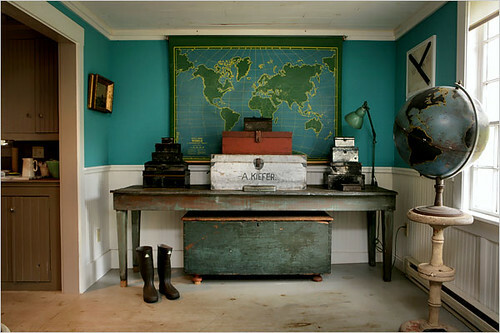 But that's not stopping me from imagining that our cabin looks more like this one (no offense, Dad... ps, call me about interior design services). 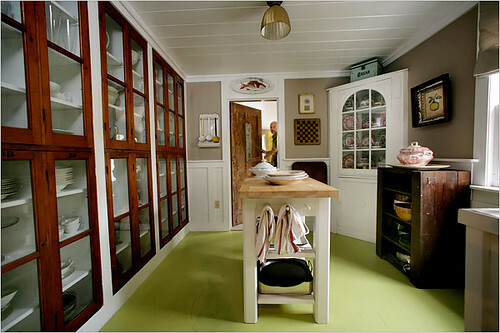 Seriously, how amazing are those kitchen cabinets made from recycled vintage school lockers? Ok, so I wish I had them in my citified kitchen, too. 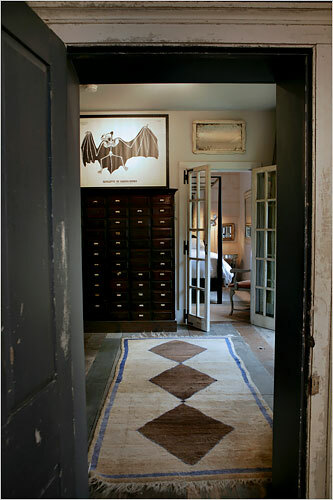 I am not hating the bat, either. 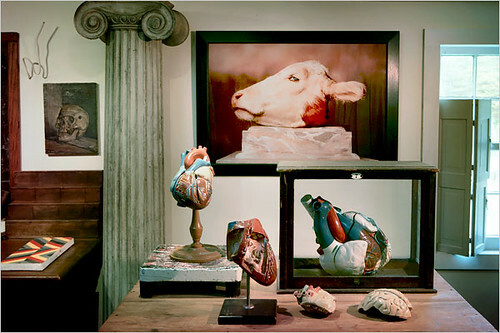 Or this Andres Serrano photograph surrounded by vintage anatomical models. Actually, I'm not hating a lot of things about this souped up quirky cabin. 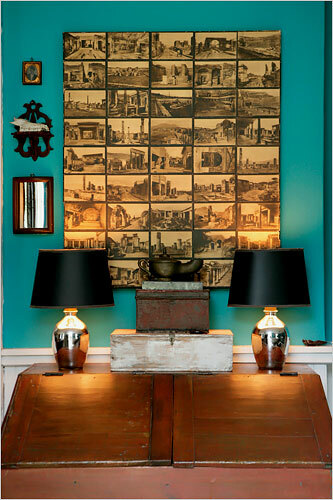 Vintage Pompeii postcards flanked by mercury glass lamps and backed by a punchy wall color? Sure. 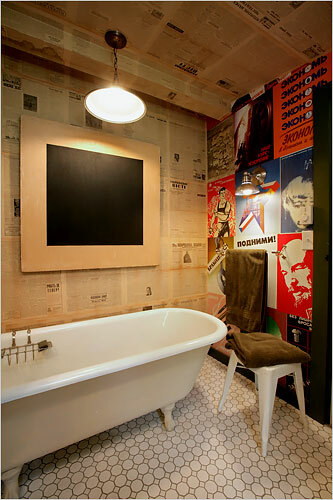 Clawfoot tub in a bathroom papered with vintage newsprint and AGITPROP posters??? Hellz yes. 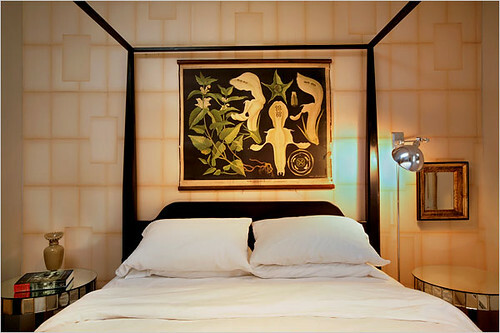 I think I saw an ancient Trading Spaces episode where Vern Yipped a room by papering the walls with old book pages -- not nearly as cool as this room papered with blank pages in a geometric pattern. 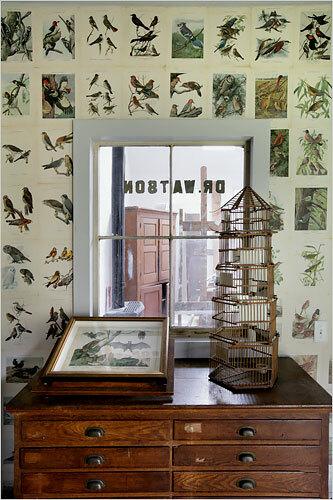 Do these vintage bird prints as wallpaper pass muster? 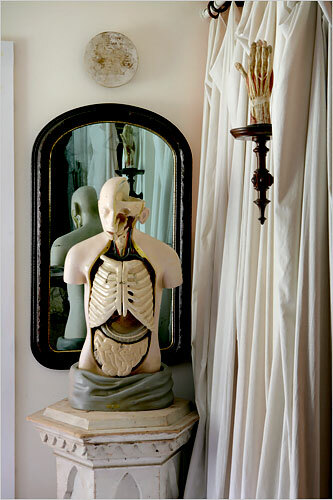 These dudes really have a thing for maps and anatomical diagrams, and that's ok by me. 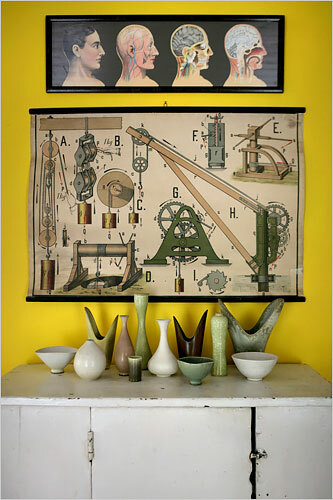 I see they are also afflicted by a pottery collecting obsession, which I can empathize with. It's a tough disease to cure. 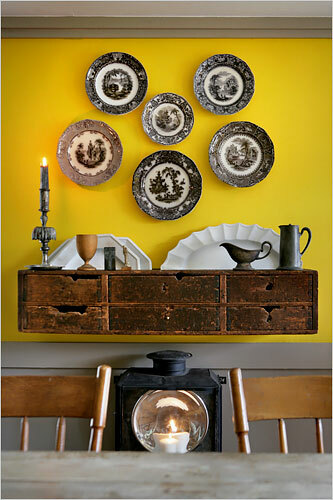 What do we think of the yellow walls, anyway? 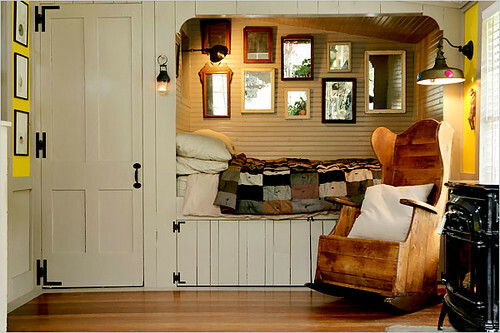 This cozy little nook is calling to me. During my 3 am panic attacks, this shall be my new happy place. Somehow I don't think I should end with this picture, but it's the only one I have left, and did I mention that I am frequently awake at 3 am? But do you know what? I'm feeling better. There's nothing like a little cozy countrification to instill a sense of calm and comfort in an anxious heart.